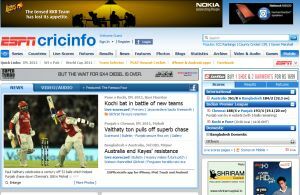 A new record was set at Cricinfo.com when 1.9 million visitors logged into the website on the day of the 2011 ICC Cricket World Cup final between India and Sri Lanka held on March 30, 2011. Market research firm IMRB recently reported that there were a total of 4 million online visitors to websites in India broadcasting and reporting on final. IMRB had recorded the number of visitors to ESPNCricinfo.com at 1.73 million but ESPN has now put the figure at 1.9 million. Across all its digital platforms, ESPNCricinfo has logged 1.8 billion page views and 4.43 billion total minutes in the 43 days of the tournament between February 19 through April 2. Besides the website ESPNcricinfo.com, it offers the ESPNcricinfo mobile Web, the mobile app and the cricket section on the ESPN ScoreCenter. "We're thrilled that fans from around the globe chose ESPNcricinfo as their digital source for news and content during the Cricket World Cup," said Tom Gleeson, Vice president, Digital Media, ESPN International. Around 36% of the total Internet audience of broadcaster ESPN went to ESPNCricinfo.com while 63.6% of its total mobile audience were on Cricinfo's mobile site. ESPNcricinfo's mobile site registered over 45 million page views. A majority of these were Indians, who contributed to 377.3 million page views for the website. Indian cricket fans spent a total of 807.2 million minutes on Cricinfo from their handsets. Other online properties by the sports broadcaster are ESPN.com, ESPNRadio.com, ESPNDeportes.com, ESPNSoccernet.com, ESPNScrum.com, ESPNF1.com, ScoreCenter. As of February 2011, the company reached the milestone of 100 million homes in which ESPN is watched.